Hitachi said the decision would cost it an estimated 300bn yen (£2.1bn) as “extraordinary losses”. Hitachi said it would also suspend work on another site, in Oldbury in Gloucestershire, “until a solution can be found”. The Nuclear Industry Association says the UK has six sites that are licensed to build new nuclear power stations and eight sites that are currently generating power. It said that all but one of the eight currently operating would be in use by 2030. The GMB union warned of an energy crisis. ONS said in 2014 that there were 15,500 people employed in the civil nuclear industry. 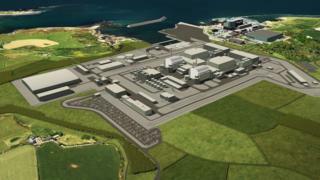 There are plans for new plants at Bradwell and Sizewell, but neither is currently under construction. The British and Japanese prime ministers met earlier this month and Theresa May said she had raised the issue with her counterpart. Are you affected by this story? Have you had any involvement in the project? Email haveyoursay@bbc.co.uk with your experiences.